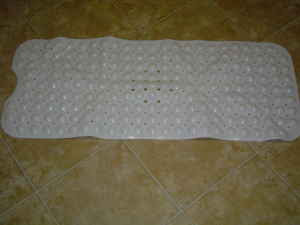 theAd>>Long tub mat. Approx. 39 1/2"L x 16"W. Slightly used. Washed and cleaned. It did work great for us until we got new tubs with the non-skid built in. This is from a pet and smoke free home. Okay, used bath mats are gross, gross, gross. They should never be resold. And....unless your dog or cat smokes in the bathtub, nobody cares about your smoke free pet-less lifestyle. It just sounds sad. You know what really is gross? The bathmats that fit around the toilet. Really, WTF? If every one started calling them "urine sop-ups" from now on do you think they would still sell?